I've been a Montessori teacher for several years and each year I find myself being asked about the necessity for mixed age grouping. 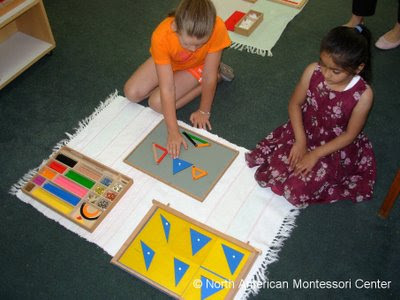 These questions usually stem from parents with children who are rising to the next level or who have not yet experienced the Montessori method. Montessori classrooms are arranged so that younger children benefit from having older peers as role models and tutors. This helps assure that each child learns at his/her own pace even though it is the teacher who sets each child's agenda. In the mixed age classroom, children are always able to find a peer who is working at their level. Montessori teachers observe how commonly new students at all levels quickly become accustomed to the Montessori classroom mainly because of how the older children mentor the younger ones. Here are some samples of questions that I have encountered over the years and the answers I provide to help assure parents that their child will be well taken care of while their developmental needs are being met. 1. I don’t want my younger child going to an older one for help. Only the teacher should help them since I can’t rely on an older child to know the answer. In the Montessori classroom, the teacher is not the primary focus of the classroom; the child is. Who better to learn from than your own peers? They have already had the presentations and had individual practice with the material. They are truly the ‘experts’ in the classroom. (I tell parents that if their younger child is not satisfied with the answer they receive from a peer, they are always able to ask a teacher for further clarification). Additionally, it is a delight to watch the joy and appreciation of the older students when their younger peers learn something new. There is a purity of emotion and lack of competition and the younger students have a true sense of accomplishment. 2. Why can’t there be a single age in a classroom? It’s really too intimidating for my child to be around all those big kids. Mixed age classrooms actually provide more stability. By staying in the same classroom for three years, the children form solid relationships and a sense of community with both their peers and their teachers. The culture of the room remains calm and stable when two-thirds of the class returns each year. The younger children look up to the older ones as role models and the older children look forward to the opportunity to be mentors. 3. I don’t want my older child to become the babysitter of the younger ones. Why should his/her education suffer? The teacher should be the one teaching. Yes, older children do take on the role of mentor in the Montessori classroom. At the beginning of the year they act as role models for how the classroom runs as well as a point of contact for basic questions such as “Where’s the bathroom?”, “Where do I put my lunchbox?”, and “When do we eat lunch?”. Older children also assist younger ones with their daily work. They may teach lessons or help check work and correct errors. This demonstrates a very high level of thinking. Being able to re-teach a skill that has been previously learned enables the one teaching to learn as much as the child receiving the lesson. Re-teaching reinforces the previously-learned concept and moves the child toward complete mastery. It also helps develop independence and autonomy in the older child, something that is often lacking in traditional settings. 4. I don’t want my young child playing on the playground with all those big, rough children. Can’t you have a separate recess for them? 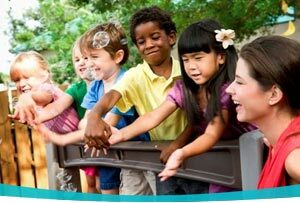 The mixed age grouping in a Montessori classroom becomes like a family for both the children and their teachers. The older children look out for the younger ones. They teach them how to play new games, how to share, and how to be good sports. They also are the first to rush to their side if someone gets hurt. They run to get ice packs and bandages. I’ve seen the biggest Montessori Middle School boy stop in the middle of a soccer or basketball game to comfort and care for a first grader who has gotten hurt. I ask parents if they separate younger siblings or cousins from playing together. The answer is always no. I gently remind them that we are a Montessori family and we look out for one another. While most parents seem satisfied with the above explanations, a few remain skeptical. Usually, by the time the fall conferences come around, they are quite happy with how their child has found their own special place within the Montessori classroom. 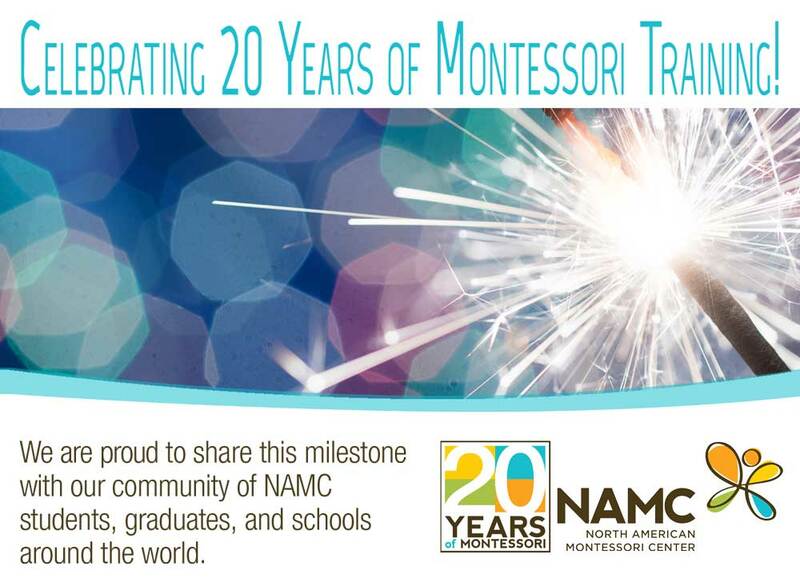 © North American Montessori Center - originally posted in its entirety at Montessori Teacher Training on Thursday, August 21, 2008.